With the advent of towing trucks and RVs, motorhomes are becoming more and more common. Think about it. How many times have you passed by a trailer park while on the highway? And if you’re one of those lucky people who has a trailer, then this article is just for you. While parking the trailer, you would have noticed that your travel trailer shakes when walking. It can be pretty annoying. Your trailer will move to the side and sway whenever someone walks across the room. Stabilizing jacks have entered the scene recently. These special heavy-duty jacks made solely for use with motorhomes and RVs are not only good for stopping shaking, but also for elevating and leveling the RV. Trust me when I say that these jacks will change your life. Fixing a wobbly motorhome is crucial, and that’s just what I’m here for. The following guide will help you learn more about the problem, its causes, and the benefits of using stabilizing jacks. Want to know how to fix a shaky living room? Read on to find out. Why Does Your Travel Trailer Shake? When To Use RV Stabilizers? How to use an RV stabilizer jack? How to Stabilize Your RV? There can be many underlying causes for your trailer to start shaking. Of course, the general idea goes that if your camper is moving, it will shake and wiggle. The real question is why does it shake horribly even when it’s not moving? There are a number of contributing factors. One of them is pretty easy to guess. It depends on the ground beneath you. If the ground on which you park is semi-solid or unstable, then your travel trailer will shake. Many people tend to use blocks on their stabilizing equipment. This helps further propel stability. However, even with these, there’s a risk of wobbliness. If the blocks are misplaced or are flexible, it can cause the entire travel to shake and move. This can be a huge inconvenience, which is why it is recommended to only make camp on tough hard ground. Apart from that, one of the biggest contributing factors is the equipment you use. Check if your stabilizing jacks or other types of jacks have some degree of flexibility. If so, you will likely experience shaking and moving inside the travel trailer. This can be minimized by buying sturdier equipment. Note that some stabilizing jacks can actually cause more shakiness. Try your hardest to buy the best types of jacks. In particular, be extra careful with scissor jacks, telescoping jacks, and hydraulic jacks. These types of equipment are known to be extra flexible. So either avoid them or buy good quality ones. So to conclude, always remember to park on strong hard ground. And be sure to reinforce the floor of your travel trailer. And be sure to get enough solid support under the jacks to make everything as stable as possible. Remember to buy inflexible jacks that won’t give way under the trailer’s weight. RV stabilizers can be defined as a series of jacks and stands which aid in stopping all types of movement. Particularly, they are helpful in preventing horizontal and vertical movement. Stabilizers are mostly used in towable RVs. These include the travel trailer and the fifth wheel trailers. Motorhomes might need them. But there are four contact points on the motorhome that give enough stability to the system. Stabilizing jacks can be used alongside wheel chocks or other stabilizing equipment. This is to make the travel trailer as stable as you can. Stabilizing jacks are the best at reducing any rocking or movement. You’ll especially notice this when walking on the trailer’s floor. Since RV stabilizers are mostly attached underneath the entire RV, they are much more efficient than chocks and other equipment. 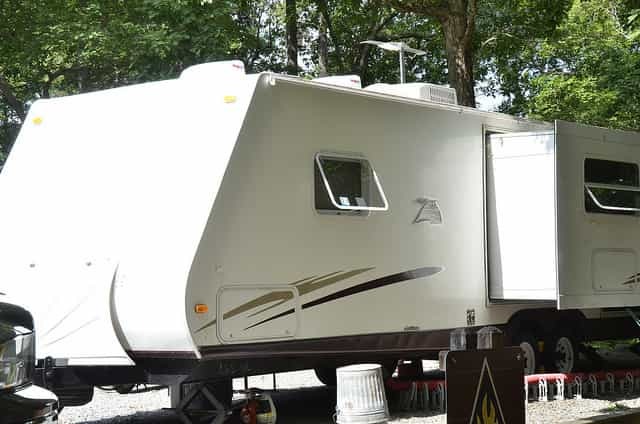 They stay connected to the RV and are fully rooted to level ground. You won’t even have to worry about your items shifting or your trailer sinking. There is a multitude of different types of RV stabilizers. The one that suits you greatly depends on the type of RV you have. For modern travel trailers, it is recommended to check the lifting capacity, lifting speed, and the clearance height. How you use the jack also comes into play here. Do you want a stabilizer that can also lift the RV up? Or do you just need it to stabilize the trailer? If you need a jack for lifting, considering checking if the product is made for that. RV stabilizers can be used to lift up the trailer (for changing tires), to level the trailer, and to stabilize it and fix it into the ground. These are especially useful if the ground is extra weak or fluid. I recommend using RV stabilizers when you’re going to park on uneven ground. This could be when parking on dirt, grass, gravel, mud, or even among shallow ponds. Make any adjustments you feel are necessary. Put as many blocks as you need under your stabilizing equipment (but not too many). Then check the rigs and make sure everything is perfect. In the end, walk around inside the trailer. You’ll instantly notice any unevenness or convulsion. This will tell you whether you need to make adjustments or not. It’s a good idea to get a general perspective of how bad the shaking is. The shaking in the RV got me wondering- How do I stop my travel trailer from rocking every time I walk to the kitchen? I finally found the answer for you. But first, you must learn to buy one. The first thing you should look for in a stabilizing jack is the lifting capacity. Even if you don’t plan on using the jack to lift up the RV, it is necessary as it will have to hold the weight anyway. The capacity of a good jack should be around a fraction of the weight of the RV. Say, for example, you have a travel trailer weighing 3.5 tons. You want to buy 4 to 5 jacks. Distribute the weight (with the weight of the interior objects included) evenly among your jacks. This should tell you exactly what capacity your jacks should have. Next, look for the lifting height and speed. If you’re not buying a jack to lift the vehicle, then this can be skipped. But eventually, you will definitely need them for leveling your trailer. So it’s best to just get them anyway. The height should be sufficient enough to lift your trailer about a foot or two. It is actually pretty hard to say what type of stabilizer you need. Your choice should be so specific that it cannot be generalized here. Using an RV stabilizer jack is easy. Simply place the jacks under the wheels of the RV and crank the lever. It is instructed to look at the manual or see tutorials online. In general, use the jack in conjunction with a number of other equipment, such as chocks and scissor jacks. I found that using the stabilizing jack was incredibly easy. And it was much more efficient in reducing the shaking of the trailer. If you’re using scissor style jacks, I’ve got a tip for you. For most scissor jacks, the weight capacity is only constant for a certain height. With decreased height, the capacity also decreases. And if you extend them too far, they will become unstable and cause a lot of shaking. Generally speaking, I recommend putting blocks under your jacks to give them a good hard surface to balance on. I suggest placing a hard piece of wood which is polished. Or perhaps use specialized RV blocks for the job. But be careful: stacking up too many blocks is extremely dangerous and it might cause the entire stack to collapse. So always be wary of these things and remember to stay focused while leveling! The question still stands. How do you stabilize a travel trailer? There are a number of options, both temporary and permanent. The travel trailer is normally supported by hitches and tires. Then these tires are joined to a highly sophisticated suspension system. The hydraulics work great when traveling on the road. But when you park, these same hydraulics make the entire cabin shake. 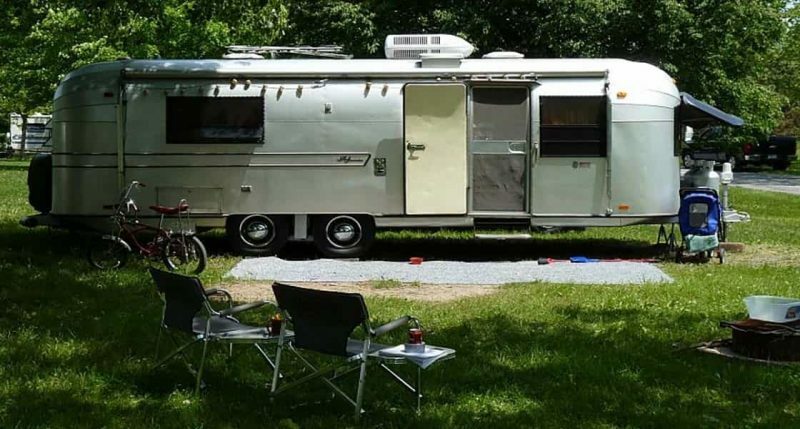 The best ways to stabilize the 5th wheel is to connect your RV directly into the ground. For this, you need to drop the landing gear. This should land safely in the ground and root you to the floor. Apart from that, you can make excellent use of stabilizing jacks. These jacks come in all shapes and sizes and can be used in conjunction with other equipment. Adding these stabilizers to the rear end will give you around 3 or 4 contact points, giving you a stronger and firmer grounding. Putting wooden blocks underneath the stabilizers will definitely make the job easier. These blocks help elevate the trailer and give main support to the stabilizer jacks. This stops them from sinking into the ground. Be careful though: too many blocks can topple over. When we’re always on the go, we would like a much more permanent solution to our rickety trailers. While there isn’t one specific choice, I do have a couple of products that you could try out. Take a look at our top 2 choices and decide for yourself which one would seem more suitable for you. You might have to invest a bit extra into these systems, so make sure you get the right one. As soon as you install it, the STEADYfast system is sure to quickly eliminate elements of bounce and shakiness from your travel trailer. The way it works is that it has 3 heavy duty large braces and around 4 large footplates that make the trailer as solid as a rock. If your RV has a self-leveling system, then you can get the footplates replaced by 3 brackets for mounting. As soon as you integrate the system into your trailer, it will only take a minute or two to lock everything in place. The main reason why I loved the STEADYfast was that of the clever design. You can see that it’s made to last. The footplates make it easier to root yourself to the ground. These plates are much better than the ones already on your trailer. These footplates are self-leveling, which means they do not require any extra blocks for elevation. Of the 3 braces, 2 are connected to the front footplates, while one to the rear. This makes the brace system extra strong and firm. These braces are much better than most travel trailer leveling jacks. All you have to do is tighten down 3 knobs and you’re good to go! These knobs are located around the perimeter surrounding the trailer. This makes them pretty easy to get access to. Once you’ve gotten everything together, and the stabilizing jacks are in place, tighten a locking knob located at each brace. The operation is very simple. And because of that, the STEADYfast Stabilizing System makes it to the very top. This is just one of the reasons why I recommend it. The STEADY fast system is extra reliable, and won’t break or fall apart under heavy pressure. Very easy to operate. Simply turn down the 3 knobs located around the trailer and you’re good to go! Best features at the best value. Now you don’t have to pay more than what you can afford. Available in two options. One for RV’s that have 4 or 6 point systems. The other one is for 5th wheel or travel trailer owners. 4 footplates and 3 braces make it extraordinarily strong and stable. Customer service isn’t the best. You’ll have to wait for hours to get a good response. The JT Strong Arm Stabilizing system is another permanent solution to shaking trailers. This one is optimal for getting rid of bouncing and shaking. The entire system is designed, planned, and manufactured by Lippert. Lippert has a reputation as the largest distributor of 5th wheel and travel trailer frames. This Strong Arm stabilizer system includes 6 stabilizing tubes and all the necessary tools needed to install and connect the entire system. The tubes are a bit smaller as compared to the STEADYfast system, but I don’t like to make the comparison. After installing the system, all you need to do is lock the tubes and you’re good to go. The system works by using stabilizing tubes to level your RV. Each tube is tied by bolts to the main frame of your travel trailer. Two tubes are attached to the front jacks, while one goes to the rear. This configuration makes for a relatively sturdier travel trailer. If you haven’t been provided with a frame rail in the middle of the rear jacks, then the task at hand becomes a bit more difficult. You might require installing a few pieces of angle iron around the bottom. This will make attaching the stabilizing jacks much easier. Stable and steady. The system removes bounce and shakiness within minutes of installation. Does not require any additional hassle when installing. Easy to operate and easy to set up. Includes all the necessary equipment. You won’t need anything new or extra to install the JT Strong Arm. Works well with stabilizer jacks, especially scissor jacks. Will be compatible with most RV’s, 5th wheels, and travel trailers. Requires twice as many stabilizer tubes for installation. This can not only increase the price but also makes installation slightly more challenging. Other options you may consider..
Are you sick and tired of the constant shaking inside your travel trailer? You don’t know how to set-up a travel trailer permanently? Well, Fast Jack has just the product for you. The King-Pin Stabilizer is meant for your 5th wheel and your travel trailer. 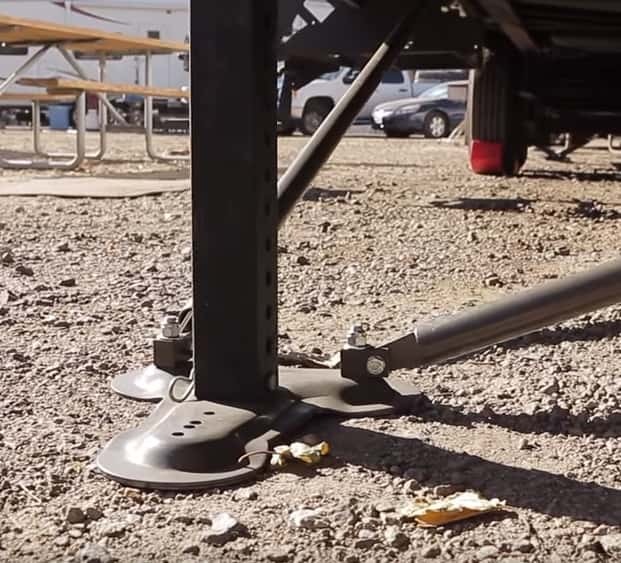 The Fast Jack stabilizer is a tripod that is placed between the floor and the trailer’s kingpin. The entire model can be adjusted between 40 inches and 60 inches. The best part about the tripod is that the entire thing weighs a bare minimum of 15 pounds. One of the reasons why I love Fast Jack so much is that the setup is relatively easier. The tripod glides over the pin very smoothly, and this makes installation and setup extremely quick. The tripod is locked into place. Then you spread the tripod’s legs apart and extend them out. This gives you a much more stable ground. The last thing you do is rotate the provided ratchet handle to tighten each leg. I would recommend the king-pin stabilizer more for 5th wheels. But in my experience, it can be used for travel trailers as well. The entire installation process will only take you around 2 minutes or less. I recommend the Fast Jack king pin stabilizer for people who use travel trailers and 5th wheels with kingpins. I do not recommend them if you’re looking for an installation that isn’t extra tedious. The BAL X-Chock is great equipment for when you have nothing else to use. Like I stated before, the hydraulics of your trailer make movement super smooth. It’s the parking that causes all the shaking. Well, these tire chocks are here to change that. The BAL X-Chocks are some of the best and most cleverly designed tire chocks for you to use. They come packed with tons of features and user-oriented options. Firstly, the BAL X-Chock system is easy to install. It needs to be placed in the middle of any two tires of the travel trailer. Next, you need to use the ratchet handle to tighten the chocks up. I love how simple the installation of these is. However, they are not a permanent solution to your RV’s dissatisfactory level. So if you want something more permanent then these tire chocks just won’t cut it for you. However, if you’re really interested, I suggest checking the equipment. It’s a great start for leveling your 5th wheel or trailer. The chocks prevent tire shifting, as they apply opposite forces on the tandem tire. These chocks work along the tire’s natural flow. So they don’t inhibit any force and the tires stay just as dynamic. The external coating is made rust resistant. This is especially useful if you’re parking in rain or in thick mud. It enhances the life of the chocks and allows uninterrupted function. You won’t have any jamming with the BAL X-Chock. The Valterra is one of the best options for anyone who wants to stabilize a 5th wheel or a travel trailer. It fits both vehicles snugly. The best part is the compact structure and design. This allows the Valterra RV Stabilizer to fold right down. It also makes setting up extremely easy. The setup hardly takes two minutes, and you’ll find that the Valterra is a better option for travel trailers than 5th wheels. The stabilizer has been constructed from the strongest type of aluminum. The height ranges from between 14 inches to 28 inches. The entire unit can support a maximum of 250 pounds (113 Kg). The weight capacity isn’t much, so you might need more units. But it’s important to put the stabilizer at key points of contact, and not under every wheel. The Valterra has two legs, both of which are joined together via the ratchet strap. The strap can easily be adjusted to change the height of the stabilizer and much more. You don’t even need to know how to use RV stabilizer jacks to use the Valterra! The aluminum frame not only provides strength but also durability and lighter weight. The Valterra also comes with its own carry bag. SO you can easily store the stabilizer away in a compartment. To be honest, I feel as if the Valterra is more portability-oriented. It is best if you want an option that can be easily stored away. It doesn’t matter how you choose to stabilize your RV. Whether you go for a temporary unit or a more permanent design, you’ll always need a few more things. Below are some of the best RV accessories. The two most major types of accessories for stabilizers are steps and jack pads. Plug it right stabilizers can also be used. Do you want something that will minimize the bounce when you’re boarding the travel trailer? Jack stabilizers hardly do that. Then you might be better off with a step. There are numerous steps in the market that you can choose from. In particular, look for one that stays in line with the level of the jacks. This will minimize the bounce and shaking when you step onto the RV. Another great accessory to buy is jack pads. These are basically pads made of wood or metal which go under the jacks to give them a good level. Just picking a plank of wood that you think is flat isn’t enough. In order to get perfect stability, you must buy a professional grade jack pad. These are normally made of wood, polymer, or some type of metal alloy. The surface is highly polished. So you know that you’ll be getting a smooth base for your jacks. These accessories are pretty important. But they can be left out if you’re on a tight budget. Still, I feel as if there’s still some way you can improve the performance of your RV and your stabilizing jacks. Check the other articles for more info on jacks and other accessories. Stabilizing jacks are my number one solution to a rickety RV. These jacks stay in place and make the RV level as well as stable.Of course, these aren’t the only things you’ll need. It’s a good idea to get jack pads (polished wood blocks) to give the jack a boost and to also make the floor a bit harder. You can also get an entrance step that also works as a stabilizer. You might buy it for reducing the shaking when you board the RV. Or you can opt for a more permanent solution, such as the STEADYfast or JT’s Strong Arm systems. These are my number one recommended permanent stabilizers for RVs. You can also opt for simple tire chocks that make the installation a bit easier but more frequent. Nevertheless, regardless of which you decide to invest in, you always need one or the other. So be sure to check out the links for the products and read my buying guide. You’ll definitely need a stabilizing mechanism. After all, you want to make sure your trailer only moves when driving! Travel trailer vs Motorhome! Which is good for you?